On behalf of the Head of School of the UWC Costa Rica and the UWC Search Committee, we are pleased to announce that after a worldwide search that generated many highly qualified candidates, Mr. Abedeen Remtulla has been selected as the new Deputy Head, effective August 2017. Abedeen Remtulla joins the UWC with a wide range of teaching and administrative experience in Ontario, Canada, earning a B.A. in Education from the University of Ottawa and a B.S. in Biology from the University of Western Ontario, followed by an M.A. in International Education with a focus on school leadership from Charles Sturt University. Abedeen’s teaching experience includes, beyond biology, mathematics, physical and health education, and communications technology. Early in his journey which began at a young age as an emigrant from Kenya, Abedeen taught biology at secondary level at a public school in Kenya. Quoted by the UWC about his life journey, Abedeen noted that “qualities of resilience and optimism ( were ) instilled in me from a very young age. I was brought up with the values of inclusion, a respect for diversity, empathy for others, and service to those less fortunate”, sentiments which align well with the UWC mission and purposes. His background in counseling and the focus on leadership as student-centered learning will also serve to support the UWC goals and challenges going forward. We extend our best wishes to Abedeen Remtulla and, on behalf of the UWC Costa Rica Community we thank all candidates who expressed an interest in the position and everyone who has assisted and supported the search process. United World College Costa Rica is a non-profit foundation that offers a two-year residential and pre-university program focused on experiential learning. UWC Costa Rica was founded in 2006 and is part of the international United World College movement, created over 50 years ago out of the inspiration to make education a force to unite people, nations and cultures for peace and a sustainable future. Our mission is to educate a diverse group of young men and women to become happy, healthy and socially responsible individuals capable through their leadership and engagement of fostering positive change in their communities in order to contribute to achieving a more sustainable and peaceful world. As the only UWC in Latin America, we offer a bilingual (English - Spanish) program, opportunities to learn more about the social, political, and cultural history of the region, and options to explore Costa Rica. Costa Rica´s long-standing history of peace, democracy, environmental protection and absence of a national military provides the ideal setting to develop UWC Costa Rica´s curriculum. Our educational program encompasses three main areas: Academics (International Baccalaureate Diploma Program), Co-Curricular and Residence Life. 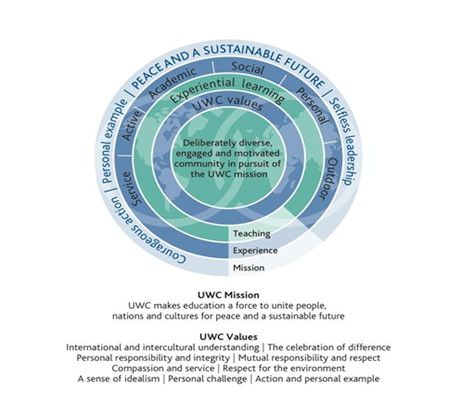 All activities and learning opportunities incorporate one or more of UWC Costa Rica´s six competencies: social responsibility, diversity, conflict transformation, sustainability, leadership, and healthy lifestyle. The International Baccalaureate Diploma Program is an academically challenging curriculum aimed at developing inquisitive minds, analytical skills and overall knowledgeable young adults. For these reasons, lectures are combined with experiential learning activities to help students develop analytical and reflective thinking skills. Co-Curricular and Residential activities also seek to develop artistic skills, promote exercise and wellbeing, as well as any other passion or interest the student wishes to explore. Particular emphasis is given to service and social entrepreneurship projects with multiple options available to students to engage actively in throughout the year. We believe that student interactions outside the classroom offer unique opportunities for learning and personal growth. A key element of the UWC Costa Rica Educational Model is providing our students a reliable support network and a safe and positive residential environment. A Residence Coordinator supervises each residence hall and trained psychologists are available to assist and guide students with their emotional, spiritual and personal needs. 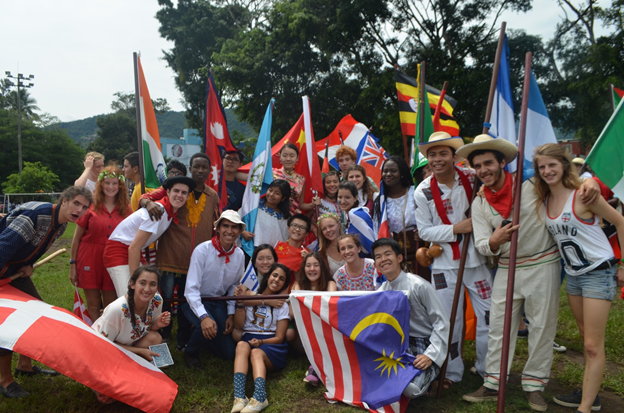 For the 2016-2017 academic year, UWC Costa Rica is home to 172 students representing 71 different countries, making us a uniquely diverse and multicultural community. In recognition to our geographic location, one-third of our students are from Latin America and the Caribbean. Also, as part of our commitment to ensure socio-economic diversity, 78% of our current student body receive some form of financial assistance through either full or partial scholarships, including students from the SOS Children’s Villages Association. Located approximately 20 minutes away from downtown San José, UWC Costa Rica’s campus is nestled within the friendly neighborhood of Santa Ana: a safe and caring community that has been very welcoming to our students and has provided many opportunities for interaction and learning, such as service projects during Social Responsibility Week. The Deputy Head is a senior level leadership position, reporting directly to the Head of School with overall responsibility for the development and implementation of the College’s Strategic Plan. In particular, the Deputy Head supervises the development and implementation of the Annual Plan, covering the three core areas that constitute the UWC Costa Rica Educational Program: Academics, Co-Curricular, and Residential Life, as well as legal and representational requirements, human resources management and certain internal aspects relating to finance, operations, safety, and conduct regulations. He/she assures that all programs and activities are aligned with the College’s mission, values, and competencies. The United World College Costa Rica has appointed Search Associates as its consultant, with Gunther Brandt as the lead consultant assisted by John Magagna. The application deadline is January 31st, 2017. Candidates are asked to submit a letter of interest and the materials listed below as early as possible, as the Search Committee reserves the right to close the selection process at any time if the right candidate is found. The review of files will begin as soon as applications are received. Finalists will be selected by the Search Committee as early in the process as possible. Finalist candidates together with their spouse (if applicable) may be invited to United World College Costa Rica to meet with the Search Committee and the Board for final interviews, as well as to visit the school campus and meet with faculty, parents, students, and non-teaching staff. A letter of application, two pages, explaining your strengths as a candidate and your interest in this position at United World College Costa Rica. OPTIONAL – a recent photo or high quality snapshot head and shoulders only.